Blythe’s first project from her crocheting classes. 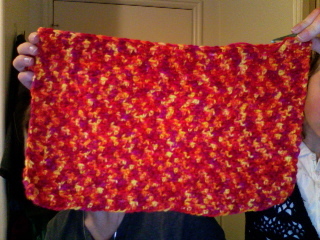 It’s the front half of a pillow. Wonderful Miss Amy consented to let me buy lessons from her for granddaughter, Blythe, for Christmas. Of course I have an ulterior motive. Blythe is going to teach me all she learns. I at least want to learn how to make an ear warmer with a big flower on it!